Within a few hours of Adrian Gonzalez being traded from the Padres to the Red Sox in December, a graphic appeared on several baseball blogs showing where every ball he hit at cavernous Petco Park in San Diego would have landed at Fenway Park. Even without taking other factors into consideration, it was obvious that Gonzalez would flourish with his new team. At least a dozen line drives and fly balls that landed in somebody’s glove in San Diego would have smacked into or flown over Fenway’s famed wall in left field. But Gonzalez never allowed himself to take a look at the chart and dream of future glory. Gonzalez looks for pitches he can drive, preferably to the opposite field, and if a big green wall happens to be standing 310 feet away down the left field line, so be it. It’s part of a disciplined approach that has made him one of the game’s best hitters. On his 29th birthday, Gonzalez’s skills, and the Fenway factor, were in full effect yesterday. He drove in two runs with a home run and two singles to help the Red Sox beat the Minnesota Twins, 9-5, before a crowd of 37,526. J.D. Drew and Jed Lowrie each drove in two runs for the Sox, who had a season-high 14 hits. Every player in the starting lineup had a hit, scored a run, or drove one in. “It’s nice to show what we’re capable of,’’ said Kevin Youkilis, who scored four times. Gonzalez was hitting .244 with one home run and seven RBIs through 12 games and went 17 games at Fenway without hitting the wall. But as others wondered whether they had been misled by some Internet trickery, Gonzalez was getting his timing down. “It’s got nothing to do with the park; it’s got to do with my swing. My swing’s getting better and I’m learning to stay behind balls and drive through them,’’ he said. Now the results are coming. Gonzalez is hitting .359 (32 of 92) in the last 22 games with 13 extra-base hits and 17 RBIs. He has hit home runs in three of the last six games at Fenway, two of them going over the wall. His batting average is up to .314 and he has a healthy .873 OPS. It’s only going to get better for Gonzalez based on his history. 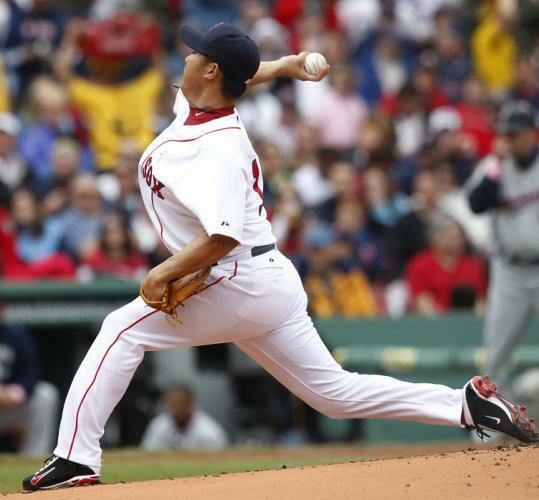 Daisuke Matsuzaka, who had thrown only six innings in the previous 14 days because of injury and inclement weather, gave up three runs on three hits and a walk in the first inning and threw 34 pitches. But Matsuzaka (3-3) regained his control and allowed only one run over the next five innings. It wasn’t quite a quality start, but it was good enough as the Sox savaged Carl Pavano (2-4). The righthander allowed seven runs on 10 hits over five innings. Pavano, one of the prospects the Sox traded to Montreal for Pedro Martinez in 1997, is 1-3 with a 12.00 earned run average in four career starts at Fenway. The Sox were 2 for 9 the first time through the order against Pavano then 8 for 16 before he left the game. “We started staying back on some of the breaking balls and offspeed pitches,’’ Francona said. The Sox scored four runs in the third inning, Gonzalez driving in one of them with a single up the middle. He then homered to left field in the fifth inning, the ball landing at the base of the light tower. Lowrie added a two-run double off reliever Jose Mijares in the seventh inning. The Twins committed three errors that led to the Sox scoring two unearned runs. The Sox have taken two games in the four-game series that ends tonight with Josh Beckett on the mound.